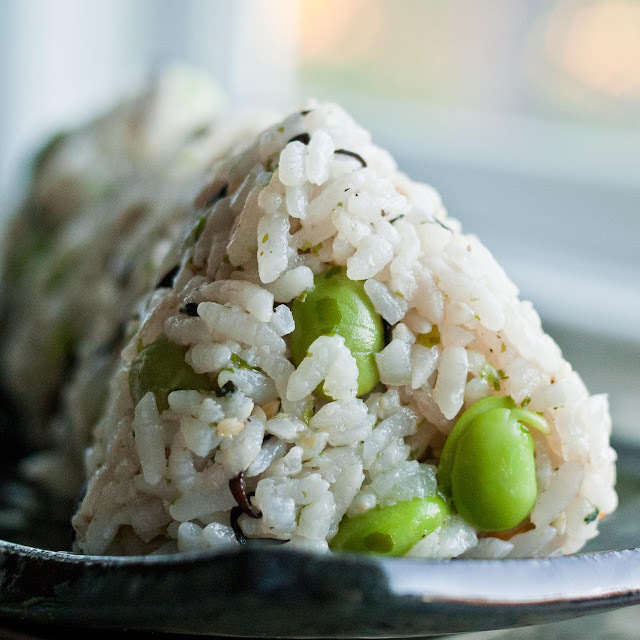 My friend Cherie told me a story about edamame rice, making it for her daughter's engagement party. She had to furiously squeeze out the beans from the pods since she didn't have a bag of the shelled ones for her party. The rice was just one dish in a whole menu series of unfortunate events, it was fun listening to my friend laugh and tell the story about all the food. And of course, since we were talking about edamame rice, I had to go home and make some. 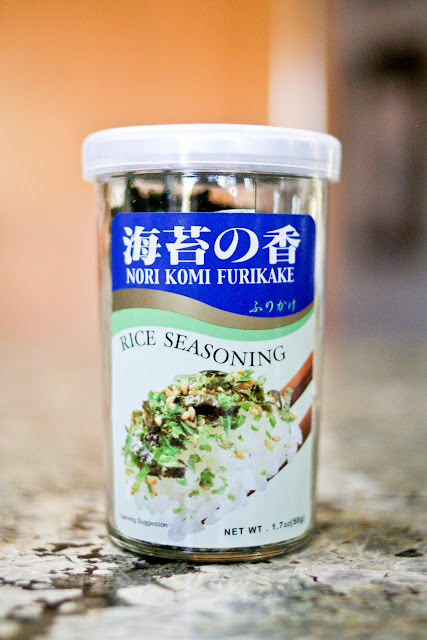 This is the furikake nori I use. There are several brands, and several different flavors. I like this one the best. 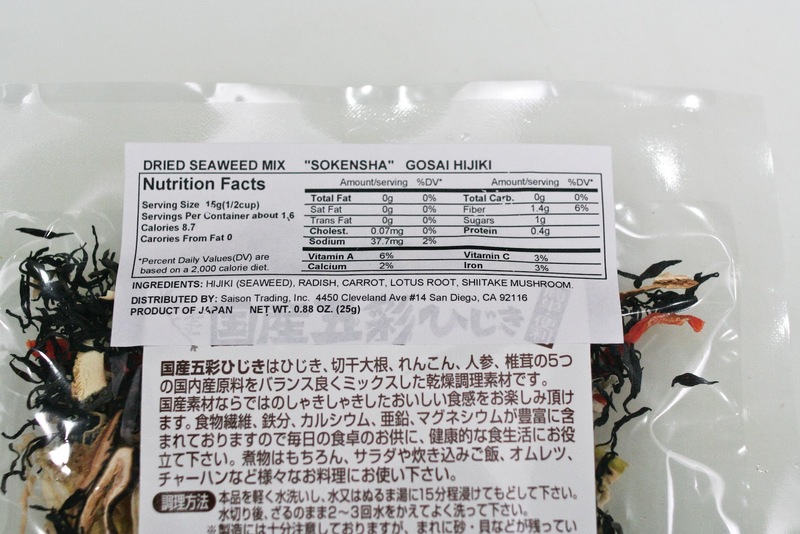 It doesn't have MSG listed as one of the ingredients. 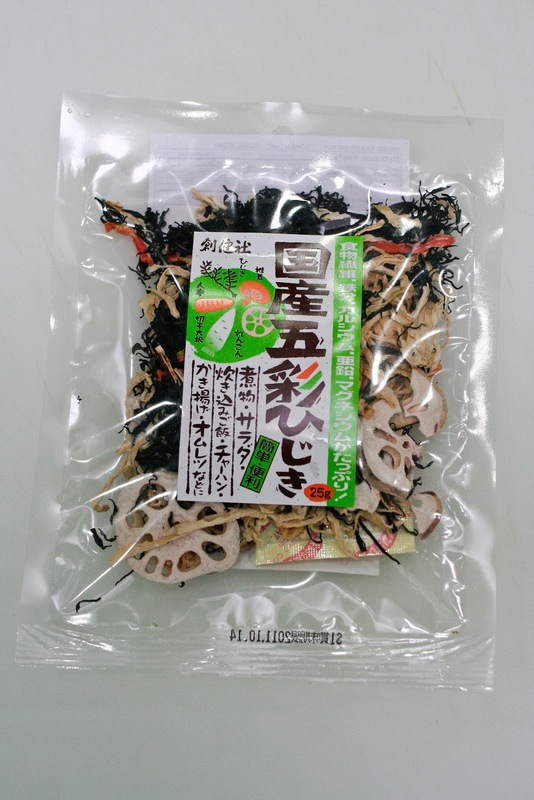 This is the dried hijiki mix. They have it at Nijiya Market, I didn't see it at Marukai. 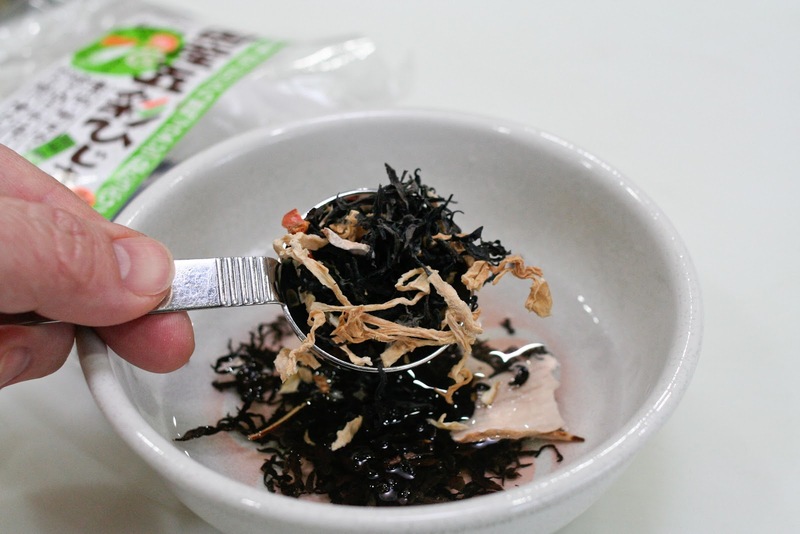 It's got dried seaweed, radish, carrot, lotus root and shiitake mushrooms in it. 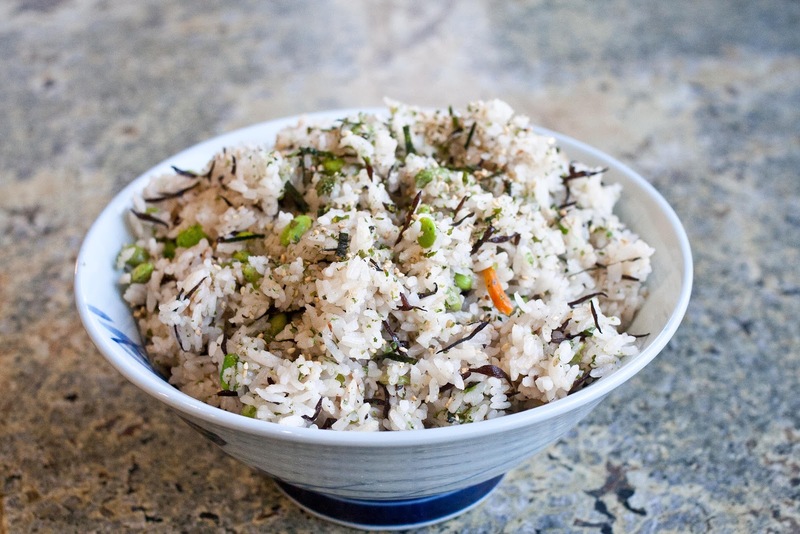 I only used a couple of tablespoons, but you could add 1/4 cup. Put the mix in a small bowl and add water to hydrate the mixture. Some of the pieces are a little big, I sliced those pieces smaller. When your rice is done cooking (and steaming for 15 minutes after it's done), mix the edamame beans and the hijiki mix (squeeze out the excess water before adding) into the rice. Cherie says use the whole jar. Here, I've made some into nigiri. 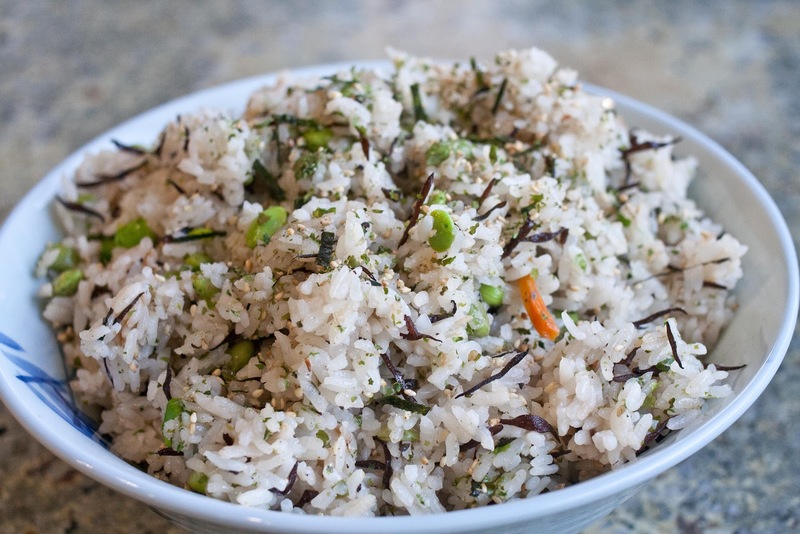 I took the edamame rice to a family celebration that night. This is my friend Cherie in Santa Cruz a couple of years ago when we went on a road trip together with her sister, her mom and her son, Pete. 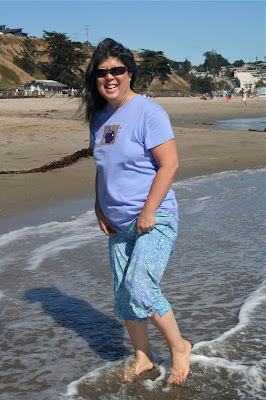 She said a trip to Santa Cruz isn't complete until you've dipped your toes into the Pacific Ocean. When we were young, our families would vacation together summers in Baja California and camp at Corona Beach. Cherie, her sister Laura, and I would ride together in the rear-facing back seat of their station wagon all the way to Ensenada, listening to Wolfman Jack on the radio (XERB, broadcasting from Mexico) and singing all the songs together. Fun summers and nice memories. Now, with Cherie & her family living in Virginia, we see one another a couple of times a year and talk on the phone. Through the years, there have been long stretches between visits. But each time we see each other again, we can pick up right where we left off, and it's like no time has passed. The mark of true friendship. 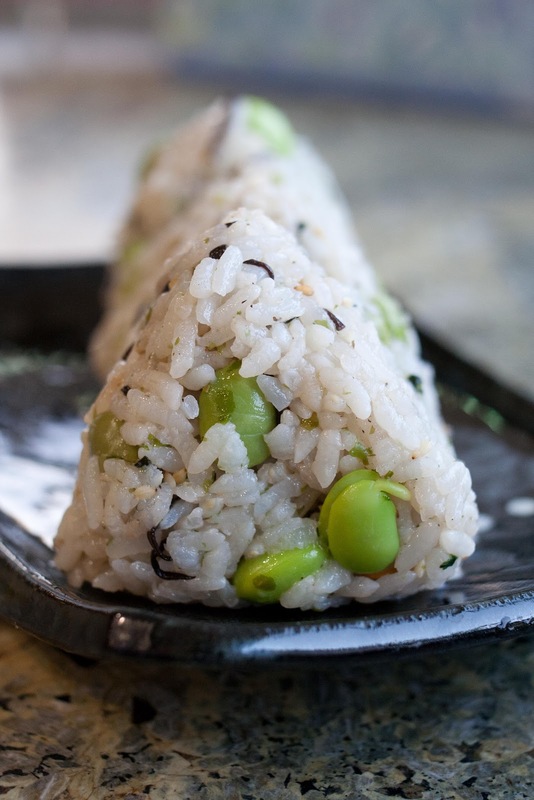 You forgot to tell your audience that you made me shell your edamame! Somehow at your house it was relaxing instead of nerve-wracking.